Awaji Island Koh-shi Japanse wierook assorti "The Finest Selection Series"
Home / Japanse wierook assorti "The Finest Selection Series"
Levertijd: Besteld voor 14.00 uur, dezelfde dag verzonden (werkdagen). Japanse wierook assorti "The Finest Selection Series"
De handgemaakte Japanse wierook van The Fines Selection Series van het merk Awaji Koh-shi is samengesteld uit pure natuurlijke producten. De wierook is met uiterste zorgvuldigheid gemaakt door de beroemde wierook meesters. First of all, incense preferences are personally-biased by nature. So the verdicts clearly differ from one person to another. 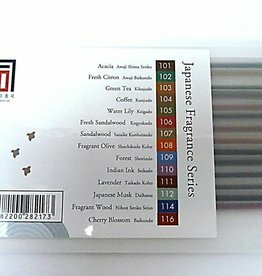 The real interesting element in all Koh-shi incense series is that they offer two types of incense: "Emits smoke" and "Limited smoke". Presenting this choice is a very appealing factor that widens the basis of incense fans in general, for the degree of smoke tolerance clearly differs among living beings, especially in closed and semi-closed spaces (here animals and plants are included!). This being said, I will only give here my verdict on the fragrances of this collection taking into account three criteria, namely a) the intensity of the fragrance, and b) its lastingness after it finished burning, and c) my own personal liking (the most subjective criterion here) for certain fragrances of course. The fragrance I liked from this series is: Floral (#112). 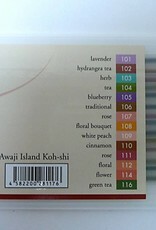 This is followed by: Rose (#107) and Floral bouquet (#108). 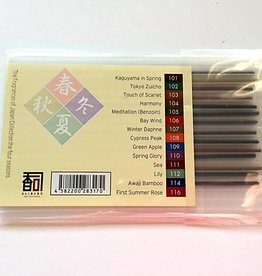 De Japanse wierook uit de Four Seasons series is van premium kwaliteit en zeer geschikt voor ontspanning en meditatie. Wij verkopen een uitgebreid assortiment wierook van Awaji Island. Awaji Island Koh-shi Japanse wierook assorti " The Four Seasons Series"
De wierook van "The Japanese Fragance Series" is verfijnd van geur en samengesteld uit natuurlijke ingrediënten van het Japanse eiland Awaji. Deze wierook is met zorg samengesteld door de beroemde Koh-shi wierook meesters. 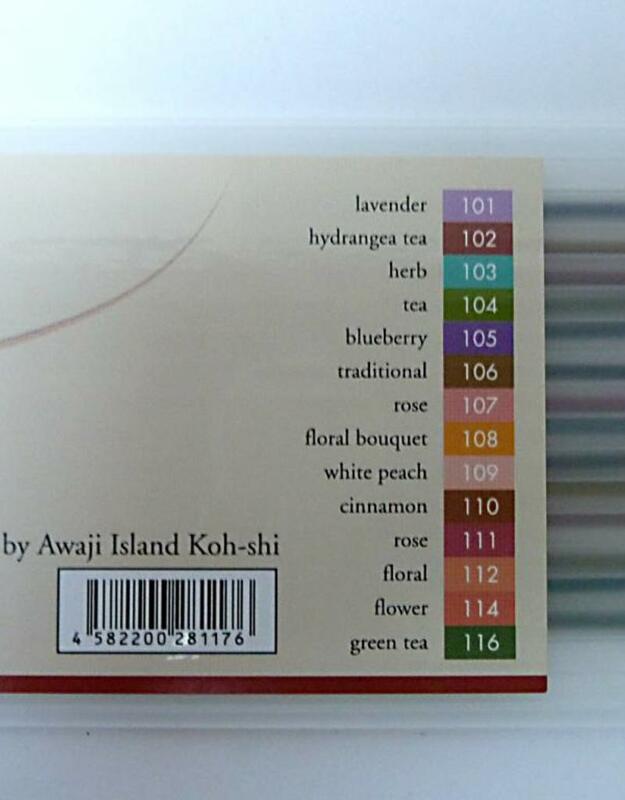 Awaji Island Koh-shi Japanse wierook assorti "The Fragrance Series"